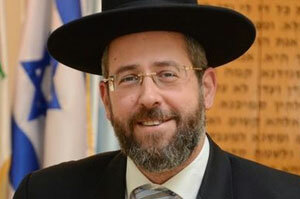 Rabbi David Baruch Lau is the Ashkenazi Chief Rabbi of Israel, achieving a majority vote on July 24, 2013. At the time of his election, he was the youngest person (at 47) to be elected Chief Rabbi of Israel. His previous positions included serving as the Chief Rabbi of Modi'in-Maccabim-Re'ut, Israel, and as the Chief Rabbi of Shoham. Rabbi Lau is the son of the former Ashkenazi Chief Rabbi of Israel, Rabbi Yisrael Meir Lau. In 2008, he published his book, Maskil LeDavid on issues of geneaology, conversion, military law, and other matters. He also edited a book of his father's responsa, titled Yichil Yisrael.